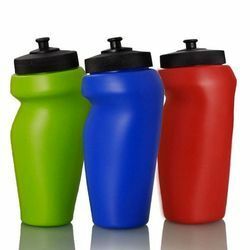 Offering you a complete choice of products which include neon sports bottle, customized banana shape sipper bottle, curved sipper bottle with straw, curved sipper bottle, dumbbell shape water bottle and grippy water bottle. 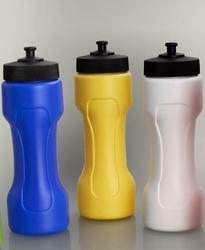 Leveraging on our vast infrastructure, we are capable of manufacturing, supplying and trading Neon Sports Bottle. 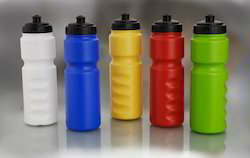 Designed at par with industry standards, all the offered bottles are provided in various sizes, designs, colors and capacities at market leading prices. Maintains temperature of contents for 4 hrs. 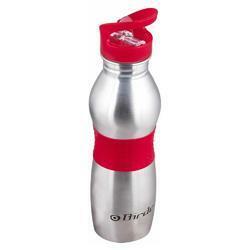 Our organization deals in providing high quality and disposable range of Grippy Water Bottle. 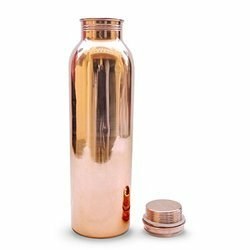 Our company has achieved widespread recognition in offering Gold Water Flask to the clients. It is practical and economical electroscope consists of leaf mounted on metal rod hold by rubber stopper in a conical flask. Offered range has some shape that gives ample space for the leaf to diverge when charged. This product is duly checked by the quality controllers on various parameters before the delivery. Offered range is largely used in various sectors. This product is widely appreciated for excellent quality by esteemed clients. Offered range is made by using high quality components and sophisticated technology under the guidance of professionals. 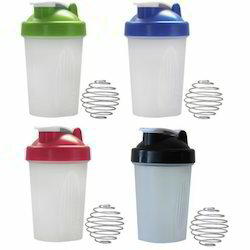 Our company has been acknowledged in offering Gym Sipper to the clients. 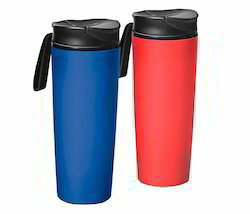 Gym Sipper is widely demanded by gym goers of all age groups for carrying water, energy drinks and juice. This product is made by using 100% food-grade plastic. This product is available in various colors as per the requirements of esteemed patrons. Offered range is duly checked by the quality controllers on various parameters as per the set quality standards. This product is available within the desired period of time at their doorsteps with a minimum order quantity of 500 sippers. 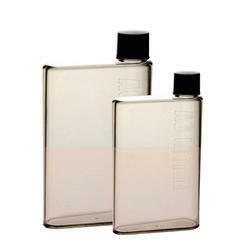 Our company is widely appreciated in offering Hip Flask 7 OZ to the clients. 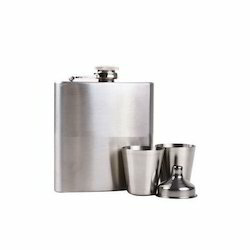 HIP Flask is carved and designed by using constant chiseling and hammering work of dexterous craftsmen with best quality material and advanced technology. Offered range is available in different shapes, sizes, capacities and trendy designs as per need of clients. This product is widely demanded for exclusive designs and impeccable finishing. Offered range is wonder of Indian tradition as the intricate carvings reveal the apex of Indian tradition. This product is tested on various quality parameters before final dispatch. 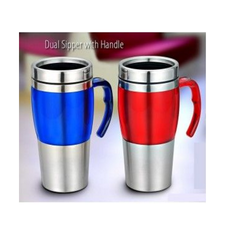 Our company excels in offering Sleek Steel Sipper to the clients. Offered range is widely demanded by clients because of wide use and sleek designs. Sleek Steel Sipper is widely used by customers in the domestic market for leak proof, attractive designs and light weight. This product is offered in a variety of models, sizes, and specifications that patrons can get as per specific needs. Offered range is checked on various quality parameters before final dispatch in the market. This product is creatively prepared under the guidance of the professionals who make use of the best quality material with the help of latest technology. 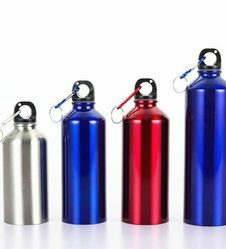 Small Plastic Water Bottle options offered comes in quality construction finish and is available in silicone material which is eco-friendly and durable material. 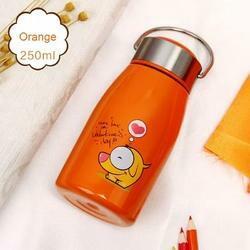 •It Consists of capacity of 450ml. 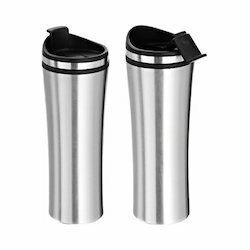 •It keeps Liquid Hot and Cold for 4hr. Keep liquid hot & cold for 6 hrs. 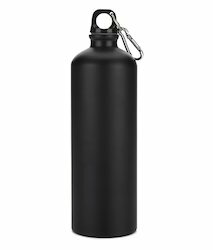 Outfitted with a modern infrastructure, we are the most prominent manufacturer, exporter, wholesaler, trader, importer & supplier of Hip Flask - Black Color 7 Oz. The offered hip flask is designed by our experts using only quality assured material as per the trends of market. 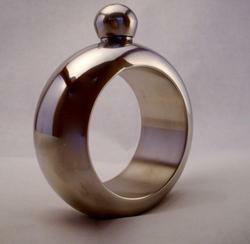 The offered hip flask can vary in shape, although they are usually contoured to match the curve of the wearer's hip or thigh, for comfort and discretion. 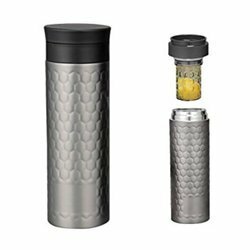 Being a renowned organization in market, we are engaged in offering a trendy yet affordable range of Hip Flask with Shot Glass Set. 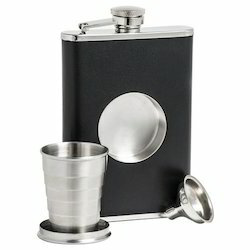 This hip flask is aesthetically designed by our affluent craftsmen utilizing excellent quality material as per the contemporary trend of market. 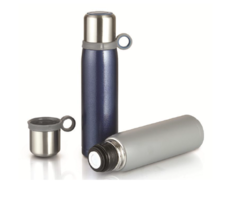 The offered hip flask is comes in different designs, capacities and prints to suit demands of customers. Also, we are giving this hip flask to customers within a given time frame at reasonable price. 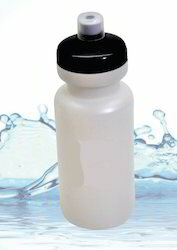 We are supplier of Memo Water Bottle. 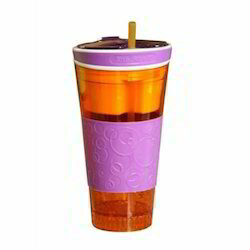 • Keeps liquids Hot and Cold for 6 hrs. 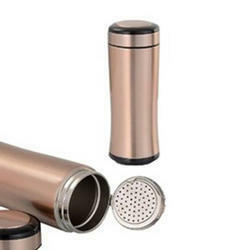 Flask Stainless Steel it is use for drink. these products are in different color. It is new product. 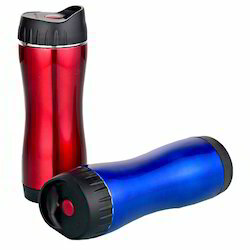 Leak Proof Mug Vacuum Thermos. Use : use for Milk. 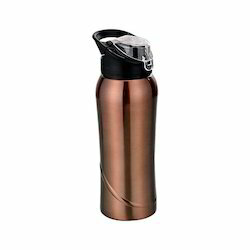 Copper Water Bottle made up up of Copper and and easy to carry for travel . 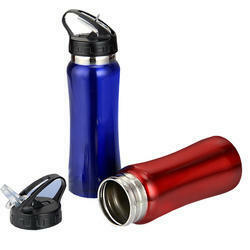 We are instrumental in offering Sports Bottle with Carabiner, which is manufactured utilizing best grade raw material. Fabricated from the finest quality of plastics along with latest technology our offered product is purely hygienic, leakage free, durable and non toxic. We are a quality conscious organization, offering a broad assortment of Hip Flask with Shot Glass. The offered hip flask is designed by our experts using best quality material in complete compliance with quality standards. 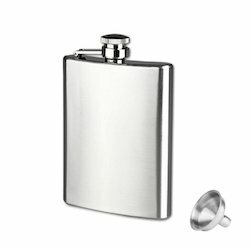 This hip flask can be also customized by our professionals in various designs and sizes as per customer’s choices. The offered hip flask is checked from our end before delivering to the customers. 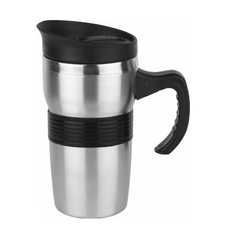 We provide Steel Sipper with Grip for our customers ideal for indoor and outdoor use . • Keep liquid hot and cold for 4 hrs. • Keep liquid hot and cold: 4 hrs. 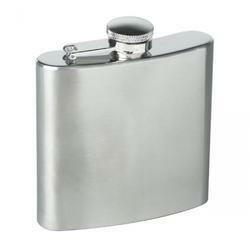 We have carved niche in the industry by offering a wide range of Hip Flask 6 Oz. This hip flask is beautified with silver colored studs will also make for a wonderful gifting option for your friend who loves to booze. 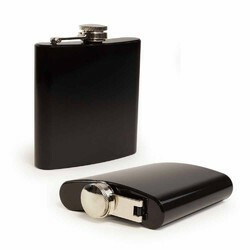 The offered hip flask is made available in various designs and sizes to suit demands of customers. Also, we are giving this hip flask to customers within a given time frame at affordable price.